South Lake Tahoe camping and RV parks offer the ultimate outdoor adventure for families who want to experience mother nature up close and personal. 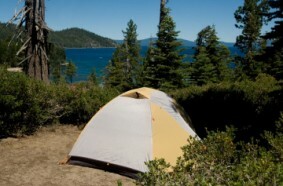 Choose from several lakefront campgrounds like Camp Richardson Campground near Emerald Bay, Eagle Point Campground in Emerald Bay and Nevada Beach and Campground near the casinos. Other popular South Lake Tahoe camping and RV parks are Zephyr Cove Resort with it’s updated campsites and Fallen Leaf Lake Campground for it’s gorgeous forest setting near Fallen Leaf Lake and Lake Tahoe. Probably the largest South Lake Tahoe RV park is Tahoe Valley Campground with their family oriented activities. Combine the amazing views of Lake Tahoe, the star filled night sky and the fresh pine air and you’ve arrived at “camping paradise.” Whether you are hiking into the backcountry or RV camping near the beach, South Lake Tahoe camping can be an amazing experience. You will discover there are many Lake Tahoe campgrounds run by the California State Parks (800-444-7275) and the U.S. Forest Service (800-280-2267) – call to reserve your spot today.